This month, David Hobby launched Boot Camp 3 over at strobist.com. It has been 2 years since the last boot camp which consists of several assignments geared towards pushing you to try new experiments and to further your knowledge and execution of lighting. I never participated in the first two boot camps, but I hope to enter into all 5 of the Boot Camp 3 assignments as they are opened. This Boot Camp will be loosely based on DH’s personal project, HOCO 360 which is a separate blog that focuses on his local community of Howard County, MD. The first assignment was to choose and photograph someone who was important, well-known, or who makes a difference in your community. I am fortunate to live in a small, close-knit community where everyone is fairly accessible and willing to help someone. After brainstorming with my wife, we threw several names back and forth, and she suggested Doug Kitchen. 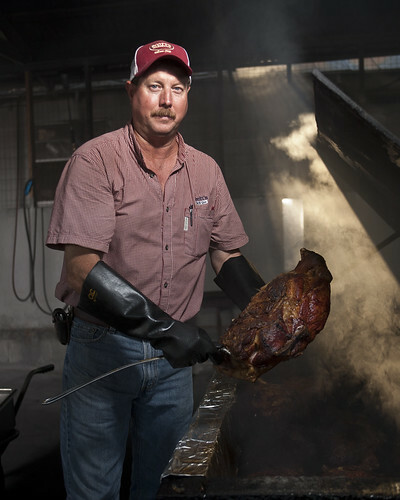 Doug Kitchens is the owner of Scott’s BBQ in Cochran, GA. After working in the restaurant for several years, he took over from his father-in-law. Scott’s is a staple in the community, and if the parking lot isn’t full, then they are probably closed. Scott’s is a tradition for almost every citizen in Bleckley County, and a highly recommended eatery for any “outsider” who visits the area. Locals know the best times to go, because an ill-timed visit may cause you to wait for a table, but no one seems to mind. Known for great BBQ and wonderfully sweet tea over crushed ice, the real winner of Scott’s BBQ is the cheeseburger. Scott’s has lasted through the trials and tribulations of a poor economy, and is Cochran’s longest running restaurant. I visit Scott’s occasionally in the mornings to deliver copies of my book, Vanishing Cochran, which they sell for me. I love the morning light as it streams into the smokehouse. I planned to take this one morning, as they smoke meat on Tuesdays and Thursdays. Well, the pit wasn’t going yet by the time I had to leave for work, so I returned at 6:30 that evening hoping the sun would be coming through the opposite side. But the rays were gone. I had another session at 7:15, so I had to work quickly and I couldn’t wait for the sun to set. However, just as I had my lights dialed in, the sun started to peek between the roofline of the building. I waited about five minutes and got this great ray of light streaming directly into the pit. It was perfect! This was the first of several takes, but turned out the best. The ham was fresh off the rack, so he couldn’t hold it long before it started burning his hand. I tweaked the color temperature and exposure a little, but did not alter the image otherwise. This image was actually blown out since I was finalizing my lights, but I was able to save it from the RAW file. I did not see anything that I wanted to change, and even if I did, I was not going to try to re-shoot if I blew the shot. I was pleased to see that I was chosen as a top pick by David Hobby, although I did not win. My photo was still shown on the Strobist blog and is now my second most viewed image on Flickr. I look forward to seeing what Assignment 2 will bring, and hope to make it back to the top again.